Subscribe to get deals from hundreds of merchants including the best of Fiji Airways! The 10% discount is applied on all fare types (before taxes) on Business Class and Economy Class, that are for travel departing from Singapore only, to the following destinations for travel dates from 1 Jan 2019 to 31 Dec 2019:. Nadi (Fiji). Auckland, Christchurch, Wellington (New Zealand). Apia (Samoa). Honiara (Solomon Islands). Nukuálofa (Tonga). Port Vila (Vanuatu). 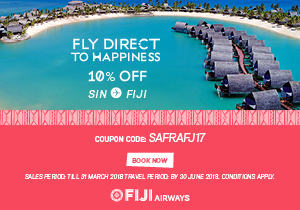 Note: All flights on FJ to New Zealand and Pacific Islands destinations above are connected via Nadi, Fiji.. Promo code must be entered in the "Coupon" field of Fiji Airways website homepage in the following format HSBC<first 6 digits of your HSBC Credit Card> Eg: HSBC438585, in order to enjoy the discount.. Promo code must be entered in the following format HSBC Eg: HSBC438585, in order to enjoy the discount. A customer who holds a HSBC credit card (except HSBC USD card, HSBC Corporate card, and HSBC Debit card) issued by HSBC Bank (Singapore) Limited (“HSBC”) in Singapore (such HSBC credit card, a “Card”) as a credit cardholder and whose credit card account is in good standing with HSBC over the entire Promotional Period (as defined below) and at the time of fulfilment (as determined by HSBC at its discretion) and who fulfils these terms and conditions (such customer, a “Cardholder”) shall be eligible to participate in the promotion (“Promotion”). Other terms and conditions apply, please refer to the merchant for more details. HSBC is not the supplier of and accepts no liability for the goods and services provided by the Merchant involved in this Promotion. The Merchant and HSBC reserve the right to vary any of these terms and conditions, or to withdraw this Promotion, at any time in their discretion without prior notice. All information is accurate as at time of publishing or posting online.. Please always check with the merchant on the validity of the promotion before purchase. Note: All flights on FJ to New Zealand and Pacific Islands destinations above are connected via Nadi, Fiji. 50% off economy class roundtrip fare from Singapore to Nadi, Fiji. Applicable airport taxes are not discounted.. Booking period: 9 - 12 Aug 2018. Travel period: 13 Aug 2018 - 30 Jun 2019. Offer is only valid for purchase of tickets originating from Singapore to Nadi, Fiji.. All bookings must be made via the participating travel agencies.. Applicable airport taxes are not discounted.. Travel blackout dates may apply.. All other terms and conditions may apply.. The management reserves the right to amend the terms and conditions without prior notice.. Please present valid SAFRA card in person upon ordering or purchasing of product(s) or service(s).. Not valid with other promotions, privileges, discount cards and promotional vouchers, whichever is applicable.. SAFRA is not an agent of the merchant. Any dispute regarding the quality or service standard must be resolved directly with the respective merchants. SAFRA will not assume any liability or responsibility for the acts of the merchants or any defects in products or services offered in the promotion.. Please always check with the merchant on the validity of the promotion before purchase.